The question wants us to write in detail about the economic significance of the Indian ocean for India. We have to give a complete picture of the importance of the region. Introduction- write a few introductory lines about the Indian Ocean Region (IOR). E.g The Indian Ocean basin is of particular importance for India, as the region’s most populous country and geopolitical keystone. First, it enjoys a privileged location at the crossroads of global trade, connecting the major engines of the international economy in the Northern Atlantic and Asia-Pacific. This is particularly important in an era in which global shipping has burgeoned. The Ocean’s vast drainage basin is important in its own right, home to some two billion people. This creates opportunities, especially given the high rates of economic growth around the Indian Ocean rim. The Indian Ocean is rich in natural resources. Forty per cent of the world’s offshore oil production takes place in the Indian Ocean basin. Fishing in the Indian Ocean now accounts for almost 15 percent of the world’s total. Aquaculture in the region has also grown 12-fold since 1980. Although global fishing is reaching its natural limitations, the Indian Ocean may be able to sustain increases in production. Mineral resources are equally important, with nodules containing nickel, cobalt, and iron, and massive sulphide deposits of manganese, copper, iron, zinc, silver, and gold present in sizeable quantities on the sea bed. Indian Ocean coastal sediments are also important sources of titanium, zirconium, tin, zinc, and copper. Additionally, various rare earth elements are present, even if their extraction is not always commercially feasible etc. The Indian Ocean matters today, arguably more than ever. It is a major conduit for international trade, especially energy. Its littoral is vast, densely populated, and comprised of some of the world’s fastest growing regions. The Ocean is also a valuable source of fishing and mineral resources. The Indian Ocean basin is of particular importance for India, as the region’s most populous country and geopolitical keystone. Today, almost 90,000 vessels in the world’s commercial fleet transport 9.84 billion tonnes per year. This represents an almost four-fold increase in the volume of commercial shipping since 1970. Presence of 13 major ports and over 200 minor ports provide avenues for exports of Indian goods to world. Blue Economy: The Indian Ocean is rich in natural resources. Energy security and resources are absolutely critical. The Indian Ocean Region is immensely rich in that. 28 million barrels per day—or nearly 80 per cent of India’s crude oil requirement—is imported by sea via the Indian Ocean. Taking into account India’s offshore oil production and petroleum exports, India’s sea dependence for oil is about 93 per cent, according to the Indian Navy. India is also the fourth-largest importer of liquefied natural gas (LNG), with about 45 per cent coming by sea. In 2014, the International Seabed Authority issued licenses for the Indian Ocean ridge, opening up new opportunities for deep seabed mining. This region is estimated to have massive reserves of manganese, as well as cobalt, nickel, and copper, all of which are scarce on Indian soil. 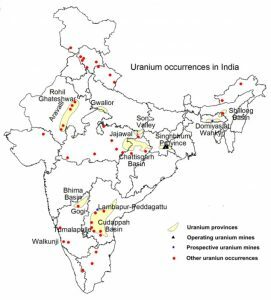 Placer Deposits – Vitally important, thorium resources in placer sands of Malabar coast are a promise to Nuclear Energy security. Similarly Placers of Thailand, Indo-China and Australia are source of precious heavy metals critically important for Electronics and semi conductors industry. Fisheries and aquaculture industries are also a major source of exports. India’s maritime exports grew 55 times in volume between 1962 and 2012 and fisheries exports now account for Rs. 16,600 crore or about $2.5 billion. Coral atolls in Lakshadweep, Andaman & Nicobar Islands attract many tourists from India as well as abroad. This helps the livelihood of many islanders. Indian Ocean is an “ocean of economic opportunities” for India. The security threats posed by State and non-state actors are impeding the progress. The Government initiatives like SAGAR, IORA, Sagarmala etc. should ensure that the fruits of Blue Economy is well reaped. The question wants us to write in detail about the mineral resources of Afghanistan. We have to discuss about the potential mineral resources and the quantum anticipated to be economically viable in the near future. Introduction– write a few introductory lines about Afghanistan. E.g mention the insurgency and foreign involvement in Afghanistan including that of India. Afghanistan, often dismissed in the West as an impoverished and failed state, is sitting on $1 trillion of untapped minerals. It is estimated that forty million years ago the tectonic plates of India-Europe, Asia and Africa collided in a massive upheaval. This upheaval created the region of towering mountains that now includes Afghanistan. This diverse geological foundation has resulted in a significant mineral heritage. 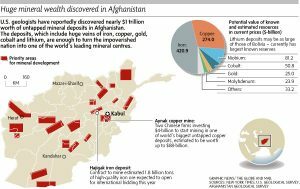 The sheer size of the deposits – including copper, gold, iron and cobalt as well as vast amounts of lithium, a key component in electronics holds out the possibility that Afghanistan, ravaged by decades of conflict, might become one of the most important and lucrative centres of mining in the world. Afghanistan could become the “Saudi Arabia of lithium”, with one location in Ghazni province showing the potential to compete with Bolivia, which, until now, held half the known world reserves. Considerably more work needs to be carried out before it can be properly called an economic deposit that can be extracted at a profit. Much more ground exploration, including drilling, needs to be carried out to prove that these are viable deposits which can be worked etc. Afghanistan, a land-locked country, is a north- western neighbour of India. More than two decades of almost constant war left a terrible legacy. Insurgency by the Taliban and counter-action by US Army, lack of stable State and involvement of many other players for their commercial and strategic interests has undermined the bountiful resources of Afghanistan. 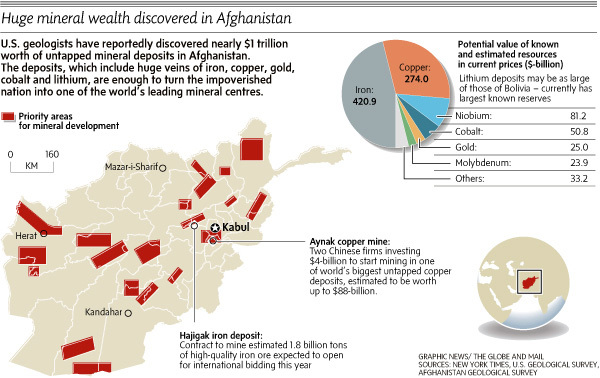 Afghanistan is blessed with huge mineral wealth which remains unexplored to a large extent. It is dismissed in the West as an impoverished and failed state. According to new calculations from surveys conducted jointly by the Pentagon and the US Geological Survey, there is $1 trillion worth of untapped minerals. The mineral deposits include copper, gold, iron and cobalt as well as vast amounts of lithium. The lithium reserves are so high that Afghanistan could become the “Saudi Arabia of lithium”, with one location in Ghazni province showing the potential to compete with Bolivia, which, until now, held half the known world reserves. Afghanistan has over 1400 mineral fields containing barite, chromite, coal, copper, gold, iron ore, lead, natural gas, petroleum, precious and semi-precious stones, salt, sulfur, talc, and zinc, among many other minerals. Gemstones include high-quality emerald, lapis lazuli, red garnet and ruby. Afghanistan’s significance from an energy standpoint stems from its geographical position as a potential transit route for oil and natural gas exports from Central Asia to the Arabian Sea. This potential includes the construction of the Trans-Afghanistan Pipeline gas pipeline. Developing a mining industry would, of course, be a long-haul process. Lack of Investors and private parties due to the fledgling socio-political environment. Political instability and weak or nascent democratic institutions are another set of problems. Poor infrastructure to transport the mined minerals. Importance for India: Indian companies have obtained licenses to mine iron-ore from Hajigak mines(world’s second-largest reserves of the mineral). India has also invested in building infrastructure namely the Zaranj-Delaram highway which links Afghanistan to Chahbahar port and part of the International North-South corridor. Strong political environment which can make policies and ensure the safety of private investors. Work on the infrastructure like regional railway network and energy trans-mega regional energy and gas pipelines are the other areas of priority. Regional groupings such as ‘Heart of Asia’, SAARC etc. should be strengthened. The political stability in Afghanistan is imperative to India’s security. The economic development in the region will in-turn reduce the political instability. Hence, it is vital to sustainably mine the huge mineral reserves of Afghanistan. The question expects us to explain the raw material needed for generation of atomic energy and explain about the distribution of the resource. 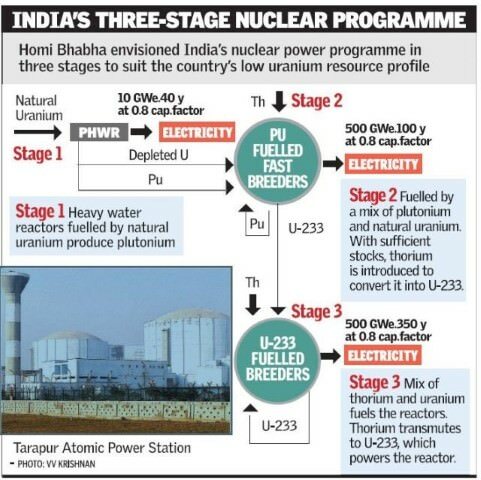 Introduction – Explain that countries like India see nuclear energy as a crucial part of their energy matrix. 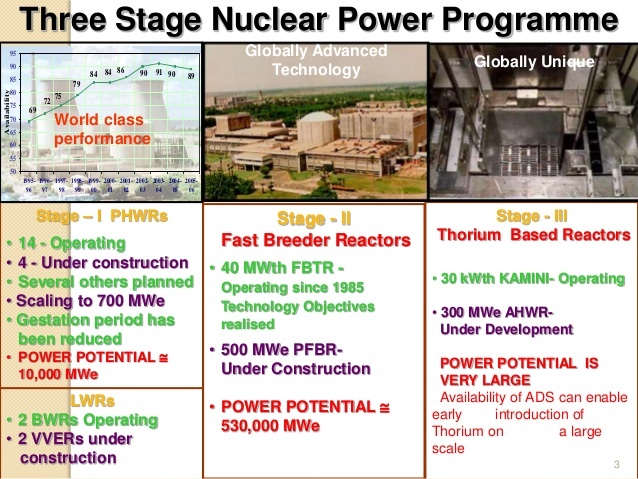 Explain about the indian three stage nuclear programme – Indian Nuclear power program has three stage, first stage requires Uranium, second stage- creates plutonium from Uranium and third stage requires thorium. Therefore, among all the radioactive elements- uranium and Thorium are the most critical for generation of Nuclear Energy. 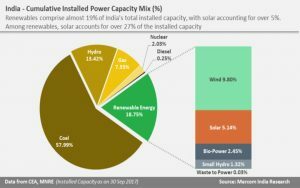 India imports almost 80% of her oil needs, generates 60% of her electricity from coal-based thermal power plants. However, these being fossil fuels, they are dwindling at quick rates. The geo-political scenario is volatile leading to energy insecurity of India. Many developing countries thus see nuclear energy as a potential for their energy security. India’s current generation of power is about 2.03% which is very less. This is despite having 21 operational nuclear power plants across the country. 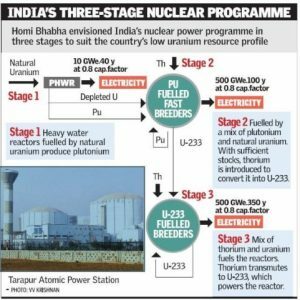 Post Independence, three-stage nuclear programme was chalked out by Homi Jehangir Bhabha to secure India’s long-term energy independence. The ultimate focus of the programme is on enabling the thorium reserves of India to be utilized in meeting the country’s energy requirements. 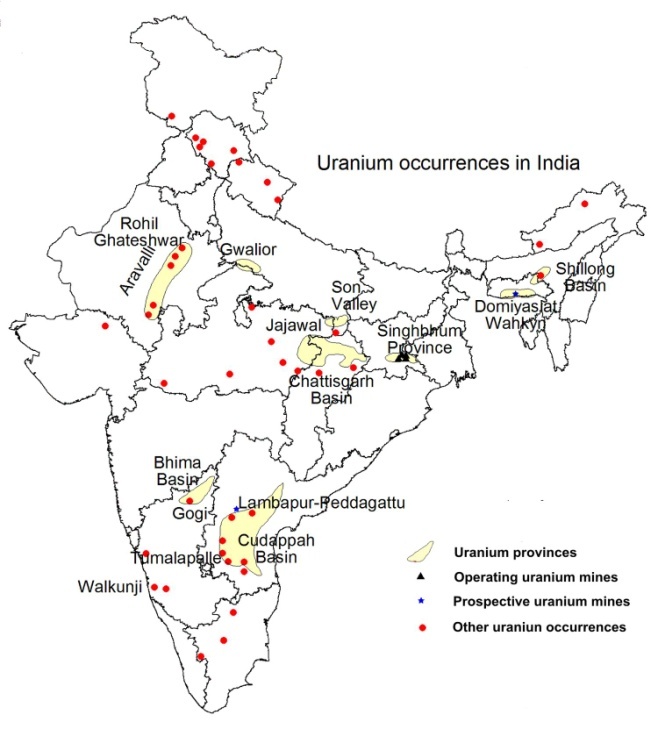 India’s thorium deposits, estimated at 360,000 tonnes, far outweigh its natural uranium deposits at 70,000 tonnes. 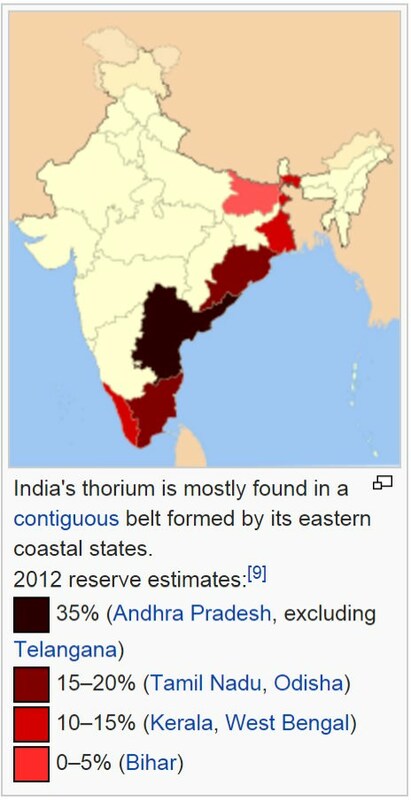 The country’s thorium reserves make up 25 per cent of the global reserves. It can easily be used as a fuel to cut down on the import of Uranium from different countries. Despite presence of Uranium and Thorium reserves, our nuclear energy production is still at low levels. This is due to. 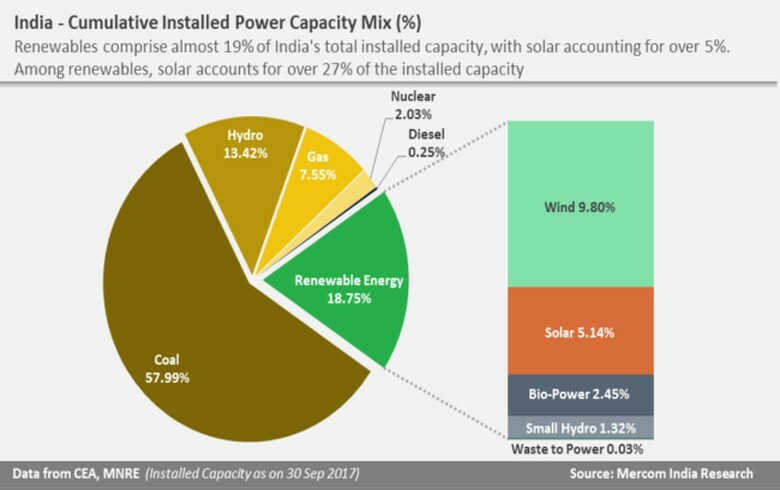 Due to disturbed supply of Uranium from different countries, India’s nuclear power plants haven’t been able to deliver the projected amount of electricity. And the contribution of nuclear power plants was least as it failed to achieve even 50 per cent of the target in first four years of the 12th Five Year Plan. Uranium extracted from the ore is first stored as uranium oxide concentrate, better known as yellow cake, when is then enriched into Uranium-235 isotope, a fuel that can be put as pellets in the nuclear fuel assembly. 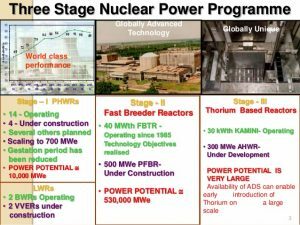 As a result it can’t be used in reactors directly. We are importing the yellow cakes. India’s signing of nuclear deal with the USA in 2008 has given her opportunities to deal with other nuclear powers like France, Japan, Russia etc. India has diversified its procurement agreements with a large number of other countries too to step up the power generation from nuclear sources. Introduction – Mention that At present, cotton textile industry is largest organised modem industry of India. There has been a phenomenal growth of this industry during the last four decades. About 16 per cent of the industrial capital and over 20 per cent of the industrial labour of the country is engaged in this industry. Body – Explain that initially textile industry developed in certain major centres such as Mumbai, Surat etc which had all the factors that are responsible for location of textile industries. Mention factors such as easy transportation, cheap labour, closer to market etc. Next, discuss the reasons for decentralization of cotton textile industry such as – Dispersal of industry from the old nuclei started after 1921 with railway lines penetrating into the peninsular region. 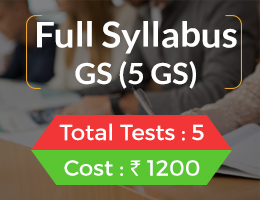 New centres like Coimbatore, Madurai, Bangalore, Nagpur, Indore, Solapur and Vadodara were favourably located in respect to raw material, market and labour than places of original locations. This industry also reached some places with some additional advantages, such as nearness to coal (Nagpur), financial facilities (Kanpur) and wide market with port facilities (Kolkata); Dispersal of cotton textile industry was further boosted with the development of hydroelectricity. The growth of this industry in Coimbatore, Madurai and Tirunelveli is largely due to the availability of hydroelectricity from Pykara dam. The industry also tended to shift from areas of high labour cost to those with low labour cost. The labour cost factor played a crucial role in establishing this industry at Madurai, Tirunelveli, and Coimbatore etc. Cotton plays an important role in the Indian economy as the country’s textile industry is predominantly cotton based. India is one of the largest producers as well as exporters of cotton yarn. The textile industry is also expected to reach US$ 223 billion by the year 2021. The states of Gujarat, Maharashtra, Telangana, Andhra Pradesh, Karnataka, Madhya Pradesh, Haryana, Rajasthan, and Punjab are the major cotton producers in India. There has been a phenomenal growth of this industry during the last four decades. About 16 per cent of the industrial capital and over 20 per cent of the industrial labour of the country is engaged in this industry. A host of factors such as low labour costs, government subsidies , irrigation, proximity to ports led to the spread of cotton textile industry. Traditionally, cotton industry in India was largely concentrated in cotton growing areas of peninsula, Like Gujarat (Surat), Maharashtra(Mumbai). These areas had advantages of proximity of market, capital facility, cheap labour, proximity to port facility and favourable humid climate. But cotton is lightweight, non-perishable material, humidity can be created artificially and there is hardly any weightloss during production. As a result, proximity to raw material becomes non-critical factor in location. Production can be carried out anywhere with cheap labour, energy and water supply is available for dyeing. Dispersal of industry from the old nuclei started after 1921 with railway lines penetrating into the peninsular region. Gradually industry shifted towards small towns and cities. 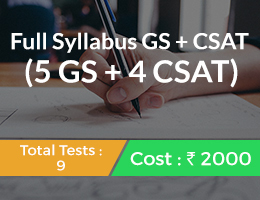 Example: centres like Coimbatore, Madurai, Bangalore, Nagpur, Indore, Solapur ,Vadodara, Jaipur, Jodhpur, Indore, Amritsar. These were favourably located in respect to raw material, market and labour than places of original locations. This industry also reached some places with some additional advantages, such as nearness to coal (Nagpur), financial facilities (Kanpur) and wide market with port facilities (Kolkata). Dispersal of cotton textile industry was further boosted with the development of hydroelectricity. The growth of this industry in Coimbatore, Madurai and Tirunelveli is largely due to the availability of hydroelectricity from Pykara dam. The industry also tended to shift from areas of high labour cost to those with low labour cost. The labour cost factor played a crucial role in establishing this industry at Madurai, Tirunelveli, and Coimbatore. Government Incentives: Handloom industry considered highly labour-intensive, beneficial to village economy and women empowerment. Therefore government aids them with measures such as Integrated Village Handloom Development scheme and National Silk Yarn Scheme. Handloom sector employs more than 65 lakh people and contributes to 15 % of total textile productions. They are widely distributed throughout the country, states of Tamil Nadu, Uttar Pradesh, Assam and Manipur account for nearly 50 per cent of the production capacity. A huge population is dependent on growing of cotton as well as textile industry. The labour-intensiveness, low-capital and high export incentives, urbanization and demand changing fashion has led to setting up of many decentralised textile centers. The article discusses the spread of demographic dividend in India across time and states and examines the kind of policy approach required to take advantage of such dividend. The question expects us to bring out how demographic dividend in India points to a differential approach and the nature of socio economic planning required to reap dividends of this demographic dividend. Introduction – explain about demographic dividend. Demographic dividend is said to be occurring when the ratio of the working age population is high and the dependency ratio in terms of proportion of children and elderly people low. This advantage can create the space needed to increase investments in enhancing human capabilities, which, in turn, can have a positive influence on growth and development. Explain that study on demographic dividend in India by United Nations Population Fund (UNFPA) throws up two interesting facts. One, the window of demographic dividend opportunity in India is available for five decades from 2005-06 to 2055-56, longer than any other country in the world. Second, and more interesting, is the fact that this demographic dividend window is available at different times in different states because of differential behaviour of the population parameters. Explain what kind of differential planning is required. For example, the focus in the states where the window is closing soon will have to be on ageing and migrant-friendly policies and programmes, while the focus in the states where the window is open and will close in the next 10-15 years will have to be on empowering girls and women, provisioning of health, education and skill development for young people, and employment generation. The focus in the states where the window is yet to open will have to be threefold—addressing harmful practices such as child marriage, access to quality sexual and reproductive health services and family planning services to all, and provisioning of health, education, life and vocational skills to all the young people. Demographic dividend occurs when the proportion of working people in the total population is high because this indicates that more people have the potential to be productive and contribute to growth of the economy. In other words, the ratio of the working age population is high and the dependency ratio in terms of proportion of children and elderly people low. 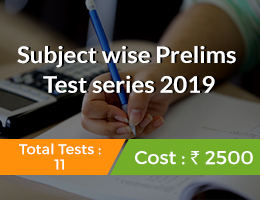 Reforms in the health and education sector, financial inclusion and adequate employment opportunities are essential pre-requisites to ensure that India’s young population is truly an asset. The study on demographic dividend in India by United Nations Population Fund (UNFPA) throws up two interesting facts. The window of demographic dividend opportunity in India is available for five decades from 2005-06 to 2055-56, longer than any other country in the world. This demographic dividend window is available at different times in different states because of differential behaviour of the population parameters. At present, India, overall as a country, has a large proportion of population that is young. Close to 30% of India’s population is in the age group 0-14 years. The elderly in the 60-plus age group are still a small proportion (8%) of the country’s population. The working age group 15-59 years accounts for 62.5% of India’s population. The working-age population will reach the highest proportion of approximately 65% in 2036. Different states have behaved differently in the past and are projected to behave differently in terms of population parameters in future also. The fertility decline across states and regions has been different. This created regional variations in the degrees and timings of fertility decline. 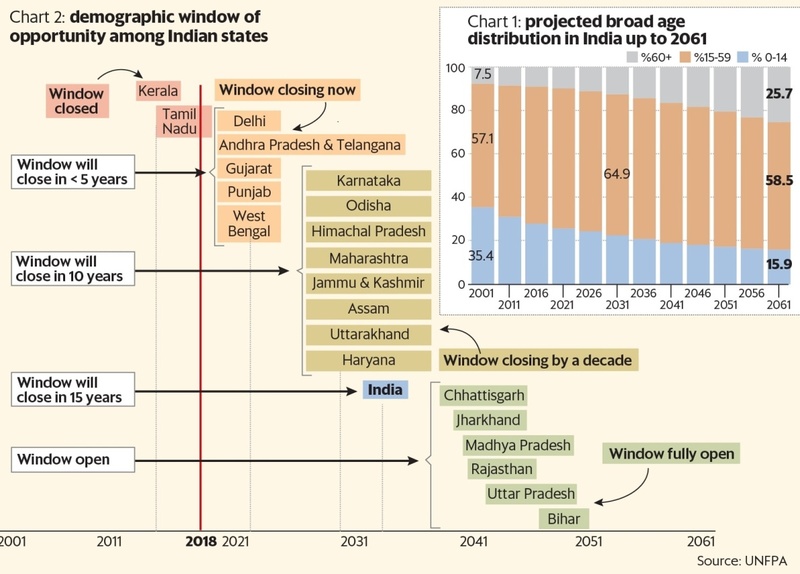 Different sets of states have their windows of demographic dividend available at different time periods. As a result, there is need for a differential approach in forward-looking policymaking and programme planning to harness the demographic dividend opportunity. Policy Priorities: three-fold – 1) addressing harmful practices such as child marriage. 2) Access to quality sexual and reproductive health services and family planning services to all. 3)provisioning of health, education, life and vocational skills to all the young people. Fine-tuning the planning and implementation of schemes and programmes by factoring in population dynamics is likely to yield greater socio-economic impact and larger benefits for people. The article delves deep into the need for a good Samaritan law, the issues involved in its implementation and what needs to be done. With Karnataka becoming the first state to bring a good Samaritan law, the focus needs to shift in replicating this in other states and iron out the flaws in the law. The topic is important both for GS2 and GS4. The question expects us to explain about good Samaritan law, highlight why such a law is important, bring out the details of the law and examine why despite such a verdict by SC, people are still wary of becoming good Samaritans. Introduction – Explain who are good Samaritans and why such a law is needed. Sizeable proportion of these deaths could have been avoided if victims had received emergency medical treatment on time. In fact, the Law Commission of India in a report, noted that over 50 per cent of road accident deaths can be averted with timely medical care within the first one hour. This translates to 70,000 lives that could be saved. Explain that In 2016, in a landmark judgement in the case of SaveLIFE Foundation versus Union of India, the Supreme Court instituted a Good Samaritan Law to insulate such persons from legal and procedural hassles that have traditionally followed the act of helping an injured person. Highlight the legislation brought about by Karnataka government. Discuss what the law entails. Explain that despite the law people are not willing to come forward to act as good Samaritans. Explain that massive gap exists between the law and its on-ground implementation. The law explicitly instructs police and hospitals to allow Good Samaritans to keep their anonymity and minimize procedural hassle. However, over half (57%) of the medical professionals surveyed and almost two-thirds (64%) of the police officials interviewed still ask for the personal details of the people bringing the injured to hospitals. The study also revealed that most of the health professionals and police personnel interviewed had not received any priming on implementing the Good Samaritan Law. None of the hospitals and police stations surveyed had displayed a charter of rights for Good Samaritans, as mandated by the Supreme Court judgement. Discuss the measures needed to address this – state governments must actively translate the judgement into state-specific Good Samaritan laws in order to establish implementation mechanisms for the law, including effective grievance redressal systems and reward and recognition schemes for Good Samaritans. Good Samaritan (helpful bystander) is a person who offers assistance to the accident victim without fear of any criminal or civil liability. The objective behind effecting Good Samaritan law is to protect the bystanders from getting embroiled into police investigation or be subjected to harassment due to the legal procedures involved if they decides to help accident victims or even inform hospital and police. As per figures from the ministry of road transport and highways, the number of people killed in road crashes in India in 2017 was 147,913 or 405 deaths every day. The 201st Law Commission of India in a report noted that over 50 per cent of road accident deaths can be averted with timely medical care within the first one hour. This translates to 70,000 lives that could be saved. India reports on an average 15 deaths per hour due to road accidents. In a report in 2006, the Law Commission estimated that 50 per cent of accident victims would have survived had they got medical attention within an hour. The major impediment for bystanders in helping accident victims is harassment by police and other complex judicial processes. In 2016, in a landmark judgement in the case of SaveLIFE Foundation versus Union of India, the Supreme Court instituted a Good Samaritan Law to insulate such persons from legal and procedural hassles that have traditionally followed the act of helping an injured person. Crowd discourages individual to take any initiative or lone action. The pressure to behave like everybody else greatly increases when someone stands in a mass. So it is natural for people standing in a crowd to simply stare rather than to do something. The fear of getting into legal entangles, police investigation and long drawn judicial procedure still runs through the minds of bystanders. Most of the people are still unaware of such Good Samaritan guidelines given by Supreme Court. Most of the states are yet to make laws in the same. For Example: 84% of the people recently surveyed by SaveLIFE Foundation across 11 cities in India were unaware of the Good Samaritan Law. Police are failing to create confidence into the minds of people that they would receive the good treatment for such noble act of helping. During investigating sessions, the person who is not the perpetrator of a crime but merely a helper of the victim is subjected to the same routine ruthlessness that the perpetrator might deserve. Law keepers and public servants are unaware of the SC guidelines. The study also revealed that most of the health professionals and police personnel interviewed had not received any priming on implementing the Good Samaritan Law. Mobiles are playing a role of spoilers as there is increasing tendency of taking photos and shooting the accident scene. Evidently, a massive gap exists between the law and its on-ground implementation. State governments must actively translate the judgement into state-specific Good Samaritan laws. Establish implementation mechanisms for the law. Reward and recognition schemes for Good Samaritans. Provision for Good Samaritans as in the Motor Vehicles (Amendment) Bill. There is urgent need of reforming police behaviour and methods of investigation towards good Samaritans. Police particularly working on ground level must be sensitized towards citizen’s concerns that deter them from offering help. Thumb rule to protect those who come forward to help accident victims from civil or criminal liability. It will be optional for them to disclose their identity to the police or medical personnel. These are still early days in the history of the Good Samaritan law. It will take a long time for people to feel secure under its provisions. The will of the society to bring positive change would save many premature deaths. Note: Karnataka came up with India’s first Good Samaritan law. According to the new law, the Karnataka government will extend financial assistance to good samaritans who help accident victims, they will not have to make repeated attendances in courts and police stations. Further, in case of mandatory attendance at courts and police stations, a Good Samaritan Fund will be created which will take care of all expenses. The new legislation stipulates that after the victim has been admitted to the hospital, the good samaritan can leave immediately and all government as well as private hospitals are bound to give first aid the accident victims. RTI has been a revolutionary legislation and has significantly increased the transparency and accountability in government functioning. However recently there have been certain attempts to undermine the act which needs to be discussed. The question wants us to express our knowledge and understanding about the RTI act and express our opinion as to whether there is a need to iron out the problems in RTI act or not. 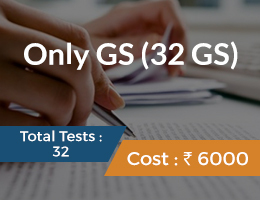 Introduction– write a few introductory lines about the RTI act- its aims and significance. Discuss the present problems with the act and the need to rectify the same E.g right to information formed the foundation of good governance, as transparency is one of its core elements; strengthening of the RTI would be a step towards transforming the covert public administrative system into a “public-centric” administrative system; There is need for measures to toughen the Act and make procedures to access information people-friendly. These measures range from the repealing of the Official Secret Act, introducing an oath of transparency to use of multi-media campaigns in local languages for awareness and opening up the working of parliamentary standing committees for public access. Central Information Commission took an average of 319 days to hear and give an order on an appeal from the date it was filed before the commission, with the maximum number of days taken by the CIC reaching to 862 days. The callous attitude of Information Commissioners (ICs) reflects in the fact that an average of 56 per cent of orders recorded violations of Section 20 of the RTI, based on which penalties should have been imposed. But a penalty was imposed in only 4 percent of the cases etc. The Right to Information (RTI) Act, 2005 is an excellent example of a grass-roots movement culminating in the promulgation of groundbreaking laws and policies to achieve its ends. 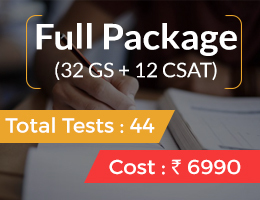 Originally envisioned to ensure that entitlements reached intended beneficiaries, the act has been used by citizens across the country to fight for a range of rights and entitlements, fight corruption, carry out research, and usher in a modicum of transparency in the functioning of public authorities. Fight corruption: Its ability to fight corruption has significantly increased its hold in India. Ensure Transparency: The enactment of this act ensured transparency in the bureaucratic systems. Fight for Rights: It has increased its position as a major incharge for the fight of rights of the people. Right to Information Act of India is world’s most extensively used transparency legislation. But despite 13 years of functionality, this act hasn’t been able to achieve the goals. Structural Constraints: The lack of staff has resulted in lakhs of RTI’ s pending. Currently, only seven ICs are working of which, along with the Chief Information Commissioner, fours ICs are to retire by the end of this year — reducing the strength of CIC to just three, against the mandated strength of 11. Act gave relaxation to political parties, judiciary, even according to OFFICIAL SECRET ACT officers refuse to provide the information demanded. Recent Proposal for amendment: It gives the power to decide the tenure and salary of the ICs to the central government; thereby, directly influencing the independence of the CIC. Delay in disposing off cases: The number of RTI Appeals with the Information Commissions is growing at a rapid pace year after year. With current volumes of appeals, there seem to be delays in disposing off cases. In Maharashtra SIC, there is a “wait period” of more than 12 months, thus discouraging citizens from filing appeals. No centralized database: There is no centralized data base of RTI (at the State/Centre level) applicants. Given the current situation, neither the State Government nor the State Information Commission is in a position to confirm the number of Public Authorities within a Department and therefore the details on the number of applications filed. Complex Process of appeal: The procedure that in followed in courts is highly unsuited for appeals under RTI. But recent proposed amendments like written submission to public authority and attach evidences, would make this process more troublesome. Pressure on RTI Activists: Almost 375 incidences of attacks on citizens have been recorded who sought information about corruption or wrongdoings in various public authorities. Section 4 of RTI: Public authorities have been lax in providing information suo moto as mandated by section 4 of RTI. This is certainly increasing RTI queries. Geographical reach: Majority of the Information Commissions are situated in the State capitals, which results in appellants undergoing an additional cost in order to attend the hearings. Role confusion: There is no clear division of responsibilities between the State Information Commission and the Nodal Department in terms of monitoring the implementation of RTI Act. A centralized database of all RTI applicants with their information requests and responses from information providers would enable the Information Commission to publish more accurate numbers in the annual reports. The State Government has to play a facilitative role to the Information Commission through issuance of supporting rules/orders to the Public Authorities. The benefits of setting up regional offices far outweigh the initial capital costs involved in setting them up. So there is a need to set up regional offices. 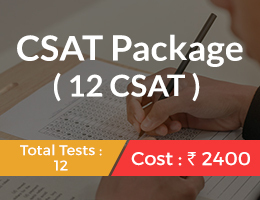 The role of the Centre/State Government is to facilitate the Public Authorities in implementation of the Act. This can happen through providing support to Public Authorities for training, development of software applications, e-Training modules, generating awareness amongst citizens etc. The second Administrative Reforms Commission has rightly called the RTI as “Masterkey to Good Governance”. The need of the hour is to weed out the flaws and plug the loopholes to guard this people’s legislation. The words of Sir Francis Bacon — “Knowledge is power” — aptly bring out the essence of the Right to Information Act (RTI). The Union government has recently mooted the idea of UBI for BPL Indian citizens. In this context it is important to discuss the pros and cons of the UBI especially in the context of Indian economy. The question wants us to write in detail about the UBI and bring out its positive points as well as cons/ limitations. 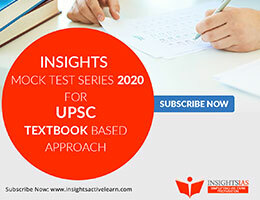 Introduction– write a few introductory lines about the central government’s idea to introduce UBI and also mention about the state of Sikkim. Discuss about UBI. E.g It characterises the basic income in five divisions — Periodic (being paid at regular intervals, not lump sum), cash payment (not in kind or vouchers, leaving it on the recipient to spend it as they like), individual (not to households or families), universal (for all), and unconditional (irrespective of income or prospects of job). Discuss the pros and advantages of UBI. E.g A Universal Basic Income promotes many of the basic values of a society which respects all individuals as free and equal. It promotes liberty because it is anti-paternalistic, opens up the possibility of flexibility in labour markets. It promotes equality by reducing poverty. It promotes efficiency by reducing waste in government transfers. And it could, under some circumstances, even promote greater productivity etc. Discuss the cons/ limitations of the UBI. E.g None of the places where UBI has been tried have levels of income disparity that exist in India. So, while the idea might work in Sikkim, it might not in, say, Bihar; The reason for maintaining conditional social assistance is to “prioritize those at the bottom of the [income] distribution; access to banking is poor in rural and backward areas; issue of gender equality as the income would be controlled by the males of the family; amount of financial resources required etc. Universal basic income is a form of social security in which all citizens or residents of a country regularly receive an unconditional sum of money, either from a government or some other public institution, in addition to any income received from elsewhere. The payment is enough to cover the cost of living. The goal is to provide financial security. The state of Sikkim recently announced that UBI will be implemented in state by 2022. Basic income schemes have also been promoted within the context of capitalist systems, where they would be financed through various forms of taxation. Prominent advocates of the concept include Philippe Van Parijs, Ailsa McKay, André Gorz, Hillel Steiner, Peter Vallentyne, and Guy Standing. It characterises the basic income in five divisions — Periodic (being paid at regular intervals, not lump sum), cash payment (not in kind or vouchers, leaving it on the recipient to spend it as they like), individual (not to households or families), universal (for all), and unconditional (irrespective of income or prospects of job). Fights Poverty and vulnerability: Poverty and vulnerability will be reduced in one fell swoop. It increases equality among citizens as envisaged in our DPSP. Choice: A UBI treats beneficiaries as agents and entrusts citizens with the responsibility of using welfare spending as they see best; this may not be the case with in-kind transfers. Nobel laureate Amartya Sen had also propounded that choice should be given to people, which will lead to development. Better targeting of poor: As all individuals are targeted, exclusion error (poor being left out) is zero though inclusion error (rich gaining access to the scheme) is 60 percent. Fighting technological unemployment: With IR4.0 on the rise, there is an increase in the automation leading to loss of many white and blue collared jobs. UBI can act as a sort of security net for the millions of people who will be left jobless by the tech revolution. Supporting unpaid care workers: Those with ill or differently abled relatives are often forced to quit their jobs and look after them full-time. UBI would allow care-workers to support themselves, encouraging care work and taking pressure off public services that provide care to the sick and elderly. Expanding the middle class: The economic growth of high-income countries is making the rich richer, but having very little effect on the working classes. The research of economists Emmanuel Saez and Thomas Piketty showed that “the bottom half of earners went from making 20 percent of overall income in 1979 to just 13 percent in 2014. The top 1 percent, on the other hand, have gone from making 11 percent to 20 percent. The pie has gotten vastly bigger, and the richest families have reaped bigger and bigger pieces from it.” UBI would help balance this inequality and expand the ever-shrinking middle class. Insurance against shocks: This income floor will provide a safety net against health, income and other shocks. Improvement in financial inclusion Payment: transfers will encourage greater usage of bank accounts, leading to higher profits for banking correspondents (BC) and an endogenous improvement in financial inclusion. Credit – increased income will release the constraints on access to credit for those with low income levels. Psychological benefits: A guaranteed income will reduce the pressures of finding a basic living on a daily basis. Ending abuse: Those who suffer domestic abuse, mainly women, become trapped in violent situations because they don’t have the means to leave them. UBI would make leaving an abusive partner easy, and would unleash the potential of countless people trapped by domestic violence. Administrative efficiency: A UBI in place of a plethora of separate government schemes will reduce the administrative burden on the state. Conspicuous spending: Households, especially male members, may spend this additional income on wasteful activities. Moral hazard: A minimum guaranteed income might make people lazy and opt out of the labour market. Implementation: Given the current status of financial access among the poor, a UBI may put too much stress on the banking system. Poor fiscal capacity: India doesn’t have the fiscal capacity to implement Universal Basic Income. Economic Survey calculations showed that a 75% universality rate with an annual Universal Basic Income of Rs 7,620 per year at 2016-17 prices will cost about 5% of the GDP. Economist Pranab Bardhan showed that an inflation- indexed Universal Basic Income of Rs 10,000 at 2014-15 prices—about three-quarters of that year’s poverty line—will cost about 10% of the GDP. Distort labour Market: Universal Basic Income can create distortions in the labour market. A steady, permanent and guaranteed income without any work is likely to affect labour mobility and participation. It can cause a rise in the wages too. Political economy of universality: ideas for self-exclusion Opposition may arise from the provision of the transfer to rich individuals as it might seem to trump the idea of equity and state welfare for the poor. Exposure to market risks (cash vs. food): Unlike food subsidies that are not subject to fluctuating market prices, a cash transfer’s purchasing power may severely be curtailed by market fluctuations. Economic Survey has suggested to replace all current cash transfers with universal basic income. Survey in a bold step ensured that universal basic income will not be distributive in nature. The burden to distribute the income will not be shared by the rich. UBI holds a lot of potential as a welfare scheme, however in its present form needs to be re-evaluated. There is a need for a 10-fold increase in resource mobilisation combined with increasing the tax base for funding. Also, UBI should not be aimed at replacing the existing welfare schemes but stick to its core ideas of providing basic income to citizens without a means test and work requirement. India: A pilot project by the Self Employed Women’s Association (SEWA) and the United Nation’s Children’s Fund (UNICEF) was implemented in Madhya Pradesh from June 2011 to November 2012, where unconditional cash transfers (UCT) were provided to the people. Citing the study, the Economic Survey 2016-17 claimed that “people become more productive when they get a basic income”. Iran : In 2010, the government of Iran ran a UBI trial, giving citizens transfers of 29 percent of the median income each month. Poverty and inequality were reduced, and there was no sign of large amounts of people leaving the labour market. In fact, people used it to invest in their businesses, encouraging the growth of small enterprises. Canada : A UBI trial in Manitoba, Canada, showed a modest reduction in workers, along with fewer hospitalisations and mental health diagnoses.